myoldmac.net - Original Rubiks Triamid by Ernö Rubik - Buy It ! 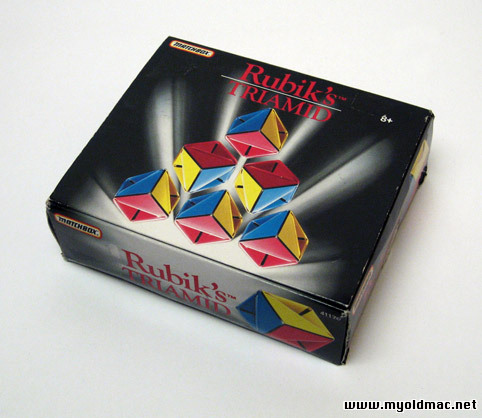 Here you can buy an original Rubik´s Triamid in its original package. See the photos. Complete with original box and plastic insert. In very good condition for being more than 16 years old and should last for many years to come. 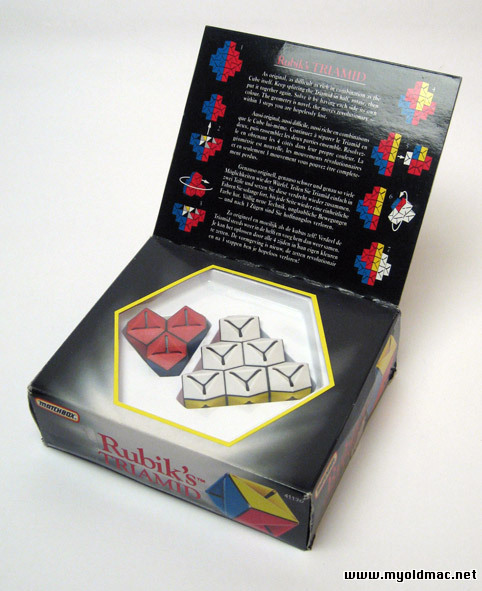 The Rubik's Triamid is not technically a "twisty puzzle," but it was given the Rubik name. The Triamid consists of ten pieces (which according to Jaap are truncated rhombic dodecahedra) and six cube-like connectors which hold them together into a tetrahedral shape. The idea is to pull the pyramid apart into two parts, one having six pieces and three connectors and one being the remaining four pieces in a smaller pyramid, then reorient the pyramid in one of eleven ways (twelve, if you count doing nothing). A triangular base section of 6 play elements ( with 3 connections in the centre ) and a small pyramid of 4 play elements. Press the 2 segments together with colours matched and the Triamid is complete - each of its sides a different colour. Important When dividing and re-attaching the small pyramid, make sure that the base section is firmly held in one hand with your fingers securely holding the three corner pieces. I also sell an original Rubik´s- : Cube - Magic - Tangle - Signed Master Cube - Clock - Link Puzzler and more! Das Rubiks Triamid von Matchbox, 1990. In original Verpackung, so nirgends mehr zu bekommen. Buy now for 58 € with PayPal, shipping cost within EU are included. All other buyers please contact me. Jetzt Kaufen für 48 € mit PayPal, die Versandkosten innerhalb Deutschlands sind enthalten.